Our Lady of Mount Carmel & Saint George is our parish church. More than 150 years ago, in 1862, the Catholic faith returned to Enfield in a small chapel that also served as a schoolroom for the growing Catholic population. By 1901 the first parish church was built, dedicated to Our Lady of Mount Carmel, but was sadly destroyed by a falling land mine during the Second World War. 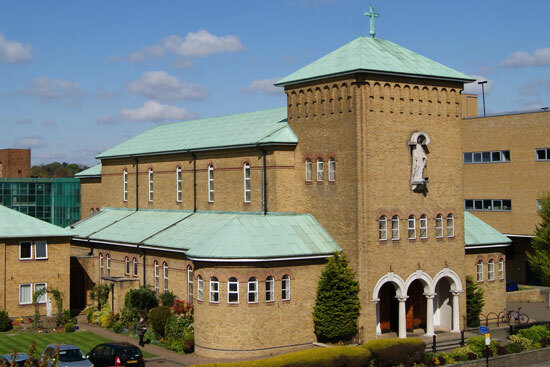 For 18 years Mass was celebrated in St George’s school until the legendary Canon O’Sullivan oversaw the building of our beautiful parish church, opened in 1958. As many parishioners remember so well, the church was refurbished and reordered in time for the millennium by Fr John Arnold and we are now fortunate to enjoy one of the most handsome churches in the diocese.